The Ink Witches live in a ramshackle house not far beyond the curtain wall that separates Castle Vyzor from the village. Some people say they're sisters from a weird family, some say they're simply business partners, a few claim they're in a polyamorous relationship. But you know how gossipy adventurers get. One known fact is that adventurers from far and wide come to the Ink Witches for tattoos. A normal tattoo that can be completed in a single session will set you back d6 x 50gp. But each Ink Sisters can also weave a bit of magic into their creations. After the tattoo is complete, the spell becomes available as a daily power, but each time it is used there is a 1 in 6 chance the ink fades. If that happens, there's a 50% chance it can be touched up at d% times the original cost. Otherwise the spell is gone and cannot be repaired or replaced with another spell. Nonstandard spells can be inked as well, but you must provide a copy that is destroyed in the process. Furthermore, there's a 1 in 6 chance the spell just won't work properly each time it is activated. The first time you get a tattoo from Gwenno, she demands a small bit of whatever clothing you are wearing, which she sews into her patchwork frock. On a successful reaction roll Mary will design a custom tattoo for some other item. This will cost 3,000gp, takes up 3 slots, requires 3 sessions, and the customer must supply the object in question. The reaction roll is +1 if you have an interesting recipe to share, as Mary is always looking for new things to make in the kitchen. Lost or damaged Useful Objects may be replaced at half the original cost, but there's a 1 in 6 chance that the touch-up work involved ruins the magic of the tattoo. 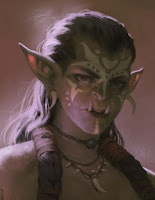 The half-orc Gretcha is the youngest of the three and the other two call her the baby of the bunch, but she's also 6'3" and looks like she could bench press a Mack truck. Her best tattoos are abstract, some featuring non-Euclidean geometry that seems to highlight extradimensional body parts that you didn't even know you had. She's much more pleasant than her Resting Orcface would suggest, and chats merrily away with customers as she works. Gretcha will discuss nearly any topic, possessing a wide-reaching knowledge of the world and its affairs that seems odd for someone so young. 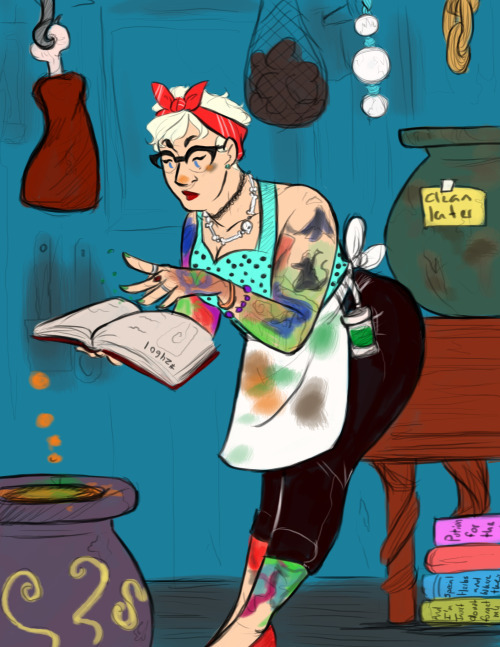 One thing she will not discuss is her magical tattoos. You pay d6 x 500gp, it takes d6 sessions and slots, and you take your chances on a random chart that you don't get to see. Think of it as a Tattoo of Wonder.